Some of us from the 104th Street Farmers' Market will be on Global TV with Lorraine Mansbridge between 7 and 8am tomorrow morning (Friday, June 5th). Tune in to see some of the friendly faces and fantastic products you can find every Saturday at one of Canada's top farmers' markets. It's true! 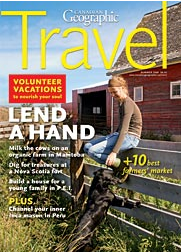 May's edition of Canadian Geographic has the City Market listed as one of the top 10 in Canada! Way to go Edmonton for supporting locally grown, baked and made goods.